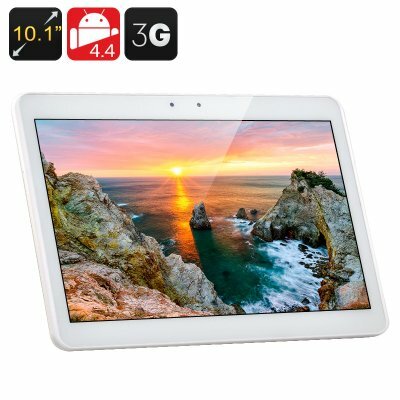 Successfully Added 10.1 Inch 3G Tablet PC - Android 4.4, MTK8382 Quad Core CPU, 1GB RAM, 2x SIM Card Slots (White) to your Shopping Cart. 10.1 Inch 3G Tablet PC has a Quad Core MTK8382 CPU, 1GB RAM and runs the Android 4.4 OS, with two SIM Card Slots this great multimedia device can also make and receive calls. The one thing that most portable gadgets lack these days is a large screen. This is vital to your enjoyment when watching movies or playing games. Most smartphone’s will let you down by having images that are just too small to really enjoy. With the 10.1 inch screen on this tablet you wont miss any of the detail and because its implemented IPS technology and displays in 1280x800 resolutions you can easily see all your content in sharp, crystal clear quality. Supporting 3G SIM slots is a major advantage to any device and this large screen tablet has two SIM slots. This lets you answer or make calls as well as providing access to the WCDMA 3G connectivity so you can surf the web no matter where you are. When you combine this function with the MTK8382 Quad Core CPU backed up by 1GB of RAM then streaming videos, playing games and downloading applications on the go are all at your fingertips. An Android 4.4 operating system makes everything easily accessible and there’s loads of customization options to make this tablet your very own. What’s more with OK Google voice commands you can use this hands free so it can double as an in car GPS and keep you connected when on the go.